This chart is a bit dated and an extreme simplification of hundreds of factors involved in full-on SEO. However it does show the relationship between SEO factors that you can influence. Citations, Reviews and Links are factors you can improve with only basic research and editing skills, thus you can improve up to 75% of your SEO without engaging expensive professionals… but with a significant time investment. Note: it is vital that you or your employee retain all login credentials for any sites that you claim or create accounts in. It can be very difficult to reclaim accounts, change information, respond to comments, etc. using different or lost logins down the line. 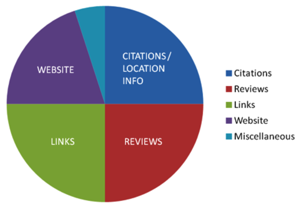 Citations are links from external authoritative websites, and the more authoritative the better. Those website listings should contain accurate and consistent NAP data across the Web. Examples of inconsistencies: Smith Co. LLC vs. Smith Co., Charlie’s Killer Crepes vs. Charlies’ Killer Crepes, 1-800-555-1212 vs. 800.555.1212 vs. 800-555-1212. Descriptions may need to vary slightly due to allowed lengths, but should still be very similar and highly brand and keyword relevant. Address listings may vary slightly depending on the search engine data: 1234 Main St. Northeast vs. 1234 Main Street NE. If you enter your address and the data provider suggests an alternate format, use their format. Double check that the map marker is correct and suggest corrections if needed. Business categories can and will vary amongst directories – be prepared with a number of options. Almost all NAP data will be in directory listings, e.g. Google Places, Bing Business Portal, ExpressUpdate, Acxiom, BBB, Yelp, Angies’ List, etc. There is no need to pay for any services at any level. For instance: Yahoo will charge you $30/month to place a listing and replicate it to other websites. However, they receive data from InfoGroup, where you can add your data for free. You will spend a lot of time creating and/or updating your business data. Fortunately this task can occur at your pace. But the sooner you control and correct your information, the faster the SEO results and the less customer confusion. Once you’ve claimed and cleaned up a large portion of your information, you will find less and less to update, and that correct listings are propagating far beyond your initial reach. Note: there is an important difference between a Local Business and a Service Area Business (SAB). A local business is a location that customers will visit - salon, bank, etc. An area business may be a locsksmith, contractor, etc. If you are a SAB, you should hide your address on your website and listings, but make sure to add your service area to your website and listings. There is a helpful article showing the differences. One very important and often overlooked detail is to make sure your domain registration is correct. You can use various online tools to check your data. They generally are a 'whois' lookup on your domain name. Those records will show your domain registrar, registrant, administrative contact, billing contact, and sometimes a technical contact. The information via whois may be masked for privacy, in which case you'll need to login to your domain registrar account and check the data. The registrant, admin & billing should always be in your name and/or your companies name. The tech contact could be your webmaster or web host. In no circumstances should you have the owner/admin/billing in the name of your contractor! If they are, and you do not have a login for the registrar, you do not 'own' your domain name!! Action: Complete NAP Tasks #1-4 below. Copy the following list to a new text only document and fill out all the information (you do not want any non plain text characters for pasting into directories). Prepare graphics and photos as needed. Store all the documents with clear file names ('my-biz-dir-info.txt', 'my-biz-keyword.jpg', etc) in a separate well-named folder for easy access. This information and images will be used to review, update, or add consistent information to your website and in many, many business directories. Check that the following websites contain accurate and consistent NAP data for your business. Login to each if you have an account (you may need to recover a login from a previous administrator). If not, create and validate an account, then add, claim, and update your listing. This covers a majority of the primary listings. Some of these websites are not directories, but data warehouses that provide information to other websites. Additional local and/or trade specific listing possibilities can be found via Whitespark, and may be worth their fee. The highly authoritative great-granddaddy of all directories is DMOZ.org, but it is unusual and lengthy to deal with. Remember to retain all login credentials for all these sites, and use different and strong passwords. Network Solutions, GoDaddy, NameCheap, etc. Possbily your hosting company: 1&1, BlueHost, HostGator, etc. Ignore any upsells of extra services from any of these services. Again you're adding as much of the NAP as possible for free. Once you have the account and your business info setup and verified, you can unsusbscribe from all emails except account notifications. Click through to check the top 50-100 search results. Yes, you will be reviewing up to 500-1500+ search results! If the result is a listing – as opposed to news, etc - try to find something similar to ‘Claim Listing’ on the page. If the listing is already Claimed, hopefully you either have the login information and have already updated the data in NAP Task #2, or know whom to contact to release the page to your authorization. You may need to do a ‘forget login’ or ‘forgot password’. Some low authority directories or websites that receive their data from other sites – including paid listings - do not have Claim or even Contact information. Ignore them. If the listing is not Claimed, create an account.Different directories will have different authorization schemes: auto-call with PIN, email validation, etc. Once you have logged into each directory and claimed the listing, edit the business information using the data created in NAP Task #1. Use Copy/Paste to ensure accuracy. Lather, rinse, repeat ad nauseum. 2-3 months after completing NAP Task #1-3, go to Yext. Enter your business name and primary phone number and scan for listings. Ignore the Special Offers, Not Verified, and all other paid service offers from Yext. Check for inconsistent or missing listings. Use the ‘view listing’ link to see the actual listing page for each entry, whether or not it looks consistent. Check each listing for accuracy and consistency with the data from NAP Task #1. Links are not provided by Yext where there are no listings. Go to the named website, and create/claim your listing. Repeat NAP Task #3 every 6-12 months and take action as required. Moz.com is another site you can use to verify listing accuracy and consistency. Reviews are the hidden gem of Local SEO: highly underused, quite influential for both users – especially mobile - and search engines, and simple to put in motion. However they may take a while to accumulate, since they are voluntary. Every (appropriate) time you contact your clients, you should politely request reviews, as soon as possible. This is especially true for an order Thank You page, customer service emails, follow up surveys, etc. You can make a small article requesting reviews to include in your newsletter 3-4 times/year. Ask your clients to post natural reviews of your service or products. Do not offer a trade, a free latte, a tchotchke, etc, for positive reviews. If there’s even a hint of stacking the deck, each service will start heavily penalizing your listing or even remove it all together, and their rules vary widely. You also may disenfranchise your existing customers. Always reply promptly and professionally to negative reviews. Reviews or Testimonials on your own site are useless for SEO (except for ecommerce product microdata, see #4 below), but can be a strong 'feel-good' factor for your clients. Check each listing in NAP Task #2 above to see if it allows reviews. If so, save the URL of your listing. Decide which 2-4 of the listings that are the most beneficial to your business and that you’ll be most interactive with. Link to those listings from your website; thank you pages & emails, contact page, your email sig, etc. Determine which channels you will use to contact your customers. Develop method(s), template(s) and a schedule for requesting reviews. Perhaps rotate sites for requesting reviews, send Google+ request only to Gmail users, etc. The gold standard for a high quality inbound link is your business name or a vital keyword phrase, used as the anchor text or alt text for an image on a high ranking website, above the fold, freshly linked to a page on your website that contains the same keyword(s) and has few but authoritative outbound links. So anchor text, 3rd party domain rank, location and age are the primary 3rd part website factors, and page rank, inbound link rank, inbound/outbound link ratio, age and keyword relevance are your primary on-page factors. After your page SEO is up to snuff, you ‘merely’ need to get relevant links to that page. Stay away from any paid link-building services, reciprocal/exchange links*, link directories, etc. We’ve already covered links to your home page using citations above, so inbound links should target pages elsewhere on your site. The following are some of the ways you can gain inbound links. *Reciprocal links in the Other category below are highly valuable and relevant – however your industry may have standards prohibiting such affiliations. Social networks: Likes, Shares, Tweets, Follows, Pins ,+1’s are all valuable SEO signals; comments not so much. A social media plan is helpful for coordinating your content, especially links back to your pages. A regular schedule is important to maintain your social SEO growth. The biggest benefit will come from compelling content that goes viral, but you can only research, plan, and write, not guarantee virality. Onsite blog or articles: the benefits of a blog are that the search engines see continually new and deep content, thereby expanding your SEO foot print, gaining you more search engine results, and more importantly, create compelling content for other sites to link to. Links do not occur automatically, so you will have to do some marketing of your content. If you have a blog, make sure you push each new entry to all your social accounts, and to Reddit, Tumblr, StumbledUpon, etc. Depending on your website platform, there are components that can automate this, or at least make it easy. A good blog schedule is two 400-500 word articles and one 1000-1500+ per week. Offsite blogs: you may gain a slight SEO advantage by starting a blog with Blogger, Wordpress, Weebly, etc. However, depending on their Terms & Conditions, you may not be able to own or control your content. 3rd party blogs: if you can get somebody – especially an expert in your field writing on an high ranked site – to write a blog and link to your page(s), you gain much SEO goodness. Example: you have a home decorating business, and Martha Stewart writes an article about you and uses your business name to link to your website. Newsletter archives: if you have a newsletter and are using a 3rd party mailer like Constant Contact or Mail Chimp, archives of your newsletters that contain links to your onsite articles are moderately beneficial for SEO. Make sure your articles are using good keyword anchors and links. Onsite archives are not much help other than internal link factors. Checkins: if you have a physical location, customer checkins via Foursquare, Facebook and Google+ are moderately valuable for Local SEO, as are Twitter Follows. You’ll need to enable checkins in your social account, and remind visitors that they can checkin. You can create QR codes for each of these networks that make it easy for your customer to act. Post a QR code in your reception area, on your service desk, or by the front door or exit. Subject Matter Expert (SME): Certain websites allow you to create an account, and then post answers to users questions. Almost invariably you won’t be able to link to your website in your answers, but the answer is linked to your profile which will have a link to your home page. The more you answer and the more users vote up your answers, the more authoritative your 2nd level link is. Examples: Reddit, Answers.com, Quora, Yahoo Answers, Google Groups. There also may be trade specific forums that you can participate in. Again they probably won’t allow direct links in answers or signatures, but will link from your profile. Press Releases, Squidoo & EZineArticles: no SEO weight and possibly even penalties. You’re better off creating news and information articles on your website. Any trade or professional organizations or memberships, Chambers of Commerce, BBB, etc. Your suppliers, manufacturers, clients, etc. Check/correct/ask for (reciprocal) links from all of your Other websites; use consistent NAP data. Create a plan and posting schedule for your social media networks. Research methods for creating viral content in your field. Start a blog and push it’s articles to other sites. Ask for reviews of and links to your articles. Ask for customer reviews of your company, service, etc. Enable customer checkins and post reminders. Find 5+ SME in your trade that publish blogs, articles, etc. Link to them via your social networks, start liking & sharing their posts. Research the answers websites to see if there are questions you can answer. If so, create accounts, answer politely & promptly (no flame wars! ), and monitor frequently. For a small to medium size business, your basic NAP should be on every page, not just your contact and/or home page. You do not know where your visitors will land on your website, and you want them to have the information immediately available, not a click away, especially for mobile users. This is more UI than SEO, and is critical for a brick and mortar business. Headers, sidebars and footers are all logical locations. Again for UI, an embedded interactive map linked to your Google/Bing business listing, and hours of operation should be prominent, perhaps on your Home or Contact page, or a sidebar. Note: Adding microdata to your NAP is a fairly new and important factor for SEO. You probably will need to work with your developer to implement these changes. Action: work with your website developer to improve your website UI and SEO. These factors are mostly not under your direct control, and are not overly relevant. However, in working on your SEO, you can improve factors like page rank, traffic volume, and visitor duration. A absolutely critical factor is maintaining website security and not having your website hacked. If a search engine finds spam or malware actions or links, they will immediately remove your search results and cut off all SEO traffic! Even after the website is repaired, it may take up to one year to recover your SEO prominence. Work with your website designer and host to ensure best practices for passwords, firewalls, etc. Ensure you’ve gained control of and corrected your NAP data. Ask for reviews across many listings, and respond positively to negative reviews. Continue to build inbound links. Work with your website designer to improve onsite SEO. Improving your local SEO results is a long-term marketing strategy incorporating diverse strategies. You can see decent results within a couple of months, but it may be up to a year for the full affect to take hold. Don’t rest on your laurels – your competitors are always trying to catch up. Get new citations, reviews, social actions and links each and every month. Use NAP Task #3 to check for your competitors’ citations and add your own along side their listing. Grow your blog for more SEO recognition. Make a viral Pinterest infographic.